A tenement building in Glasgow has partially collapsed as the remnants of Hurricane Ophelia brought high winds to parts of Scotland. Firefighters were called to the unoccupied building in Albert Road, Crosshill, at about 04:00 after reports of debris falling into the street. Three floors of the building were damaged in the collapse at the front of the building. 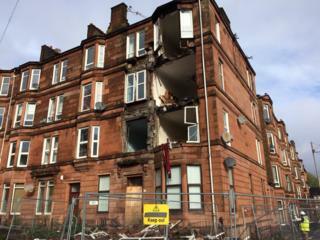 Scotland Fire and Rescue said no-one was injured in the incident. An exclusion zone had already been put in place around the block, which had been due for partial demolition. A fire service spokesman said it had been alerted following reports of debris falling from an unoccupied tenement building on Albert Road. "A total of seven appliances were immediately mobilised to the scene and firefighters found part of the front face of the building to have collapsed," he said. "There were no casualties and crews left the scene after ensuring the area was made safe." A spokeswoman for Glasgow City Council said the tenement, which contained private flats, had been empty for more than a year due to structural concerns around the windows. "Responsibility for repairing the property lies with the private owners, however the council had offered them financial assistance to help with the cost of repair," she said. "Stabilisation works to the property and removal of the bay window areas were due to commence on site within the next two weeks following the appointment of a contractor, by the owners' agent. "Unfortunately, Storm Ophelia hit the city and there was a collapse. The exclusion zone did its job and contained the debris and, because we previously evacuated the building, no-one was hurt." Elsewhere in Scotland, the high winds overnight tore off roofs and brought down trees. Scottish Power said that 1,300 homes were off supply overnight, with the vast majority of those affected in Dumfries and Galloway. By Tuesday evening, the company said all customers were back to a full service. Met Office yellow warnings had been issued for much of southern, central and eastern Scotland after wind speeds hit 76mph (122km/h) in some areas.